The Runnymede Job Club has been running since January 2015. It’s aim is to help anyone who needs a little extra help looking for work. Our volunteers are able to offer help with things such as putting a CV together, online job applications and form filling, as well as giving a bit of old fashioned encouragement. From time to time we also run workshops that focus on things such as improving your interview technique, refining your CV and identifying your skills. The Runnymede Job Club is open on Tuesdays*. 11:30-12:30 – ‘Lunch ‘n’ Meet’is where we share a simple free lunch. It’s a time to get to know one another, and share experiences and job opportunities. 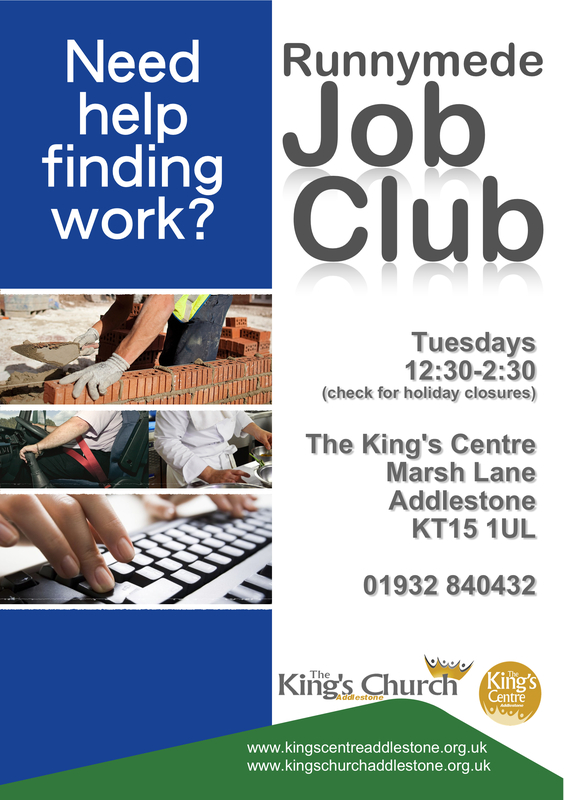 12:30-2:30 – Job Club drop in.One to one help in finding employment. There is no need to book an appointment, so if you need help finding work then drop in and pay us a visit.